Work related VPNs. There were multiple VPNs to access different parts of the internal networks. Handling multiple VPN files was very cumbersome. For convinience let’s assume we have a single network here – 172.16.200.0/24. Internal network on my VPS/Cloud VM – 10.207.185.0/24. Home networks – 192.168.10.0/24 and 192.168.50.0/28(management network). Additionally I needed a way to remotely access all of these if required. Only home network and the remote network would have uni-directional access to the work related VPNs. Setup work related VPNs on a VPS. Source NAT traffic coming from home/remote network. Site to site VPN between home firewall(pfSense VM) and VPS. 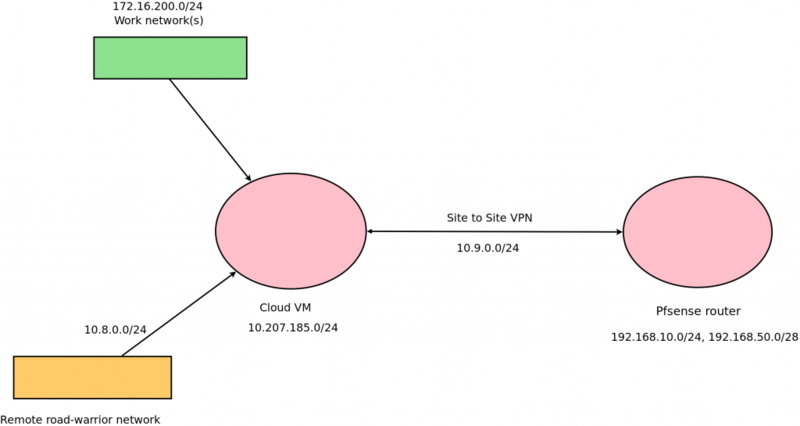 Add static routes on either end to access required networks. Remote VPN to access everything. Where vpn-client.conf is the name of the VPN client file. Additionally you will have to source NAT to allow traffic from networks you want. I am using pfSense on my home firewall/router. Incase you are using the normal Linux OpenVPN client, you can try this guide. This works perfectly fine with ISPs that do not provide a public IP(NATed IP) and failover works perfectly fine if you have multiple ISP uplinks. Firstly we’ll have to generate the security key. You can do this with sudo openvpn --genkey --secret /etc/openvpn/vpn.key and allow OpenVPN process to read the key with sudo chown -R nobody:nogroup /etc/openvpn/vpn.key. You will also need to allow IP forwarding with sudo echo 1 > /proc/sys/net/ipv4/ip_forward && sudo sysctl -p /etc/sysctl.conf. This is the config that I used on the Cloud VM end. Open up port 1194 if you are blocking incoming connections. Save this as server.conf and enable/start the service. Shared key: Copy paste from /etc/openvpn/vpn.key on server end. Goto >Status>OpenVPN and enable the process, goto >Interfaces>Assignments and add the OpenVPN interface and enable it. In the >Firewall>Rules enable everything coming in through the VPN interface. You can tweak this later. If everything worked like it should you should be able to ping the other side from your home network. If not, check the logs. A remote VPN setup is necessary in case you are not connected to the home network or are outside. There are many people who have very good guides on setting this up. You can refer to the Digitalocean guide. You will have to run this service on a port other than UDP/1194. I’m using UDP/8080. The other change is that you have to ignore the Push DNS Changes to Redirect All Traffic Through the VPN section and push the required routes only by adding this to config file. push "route 172.16.0.0 255.255.255.0" push "route 192.168.10.0 255.255.255.0" push "route 192.168.50.0 255.255.255.240" push "route 10.207.185.0 255.255.255.0"
Connect to the VPN from a non-home network and verify everything works correctly by pinging desired nodes. The end result should be that you should be able to connect to all your networks with just one VPN config/certificate file. There are cases where I have to connect to/am connected to remote VPN on the home network. In that case, that can totally mess up the normal home traffic. For that there is a simple solution. We have to push a less specific route for the home networks via the remote VPN setup. Let’s change the subnet mask in the above eg. to one value more for the concerned subnets. push "route 192.168.10.0 255.255.254.0" push "route 192.168.50.0 255.255.255.224"
This process may be different for other DHCP clients. For instructions for dhcpd follow this link. I made a short video to demonstrate how well this all works while switching between WiFi/LTE. So end result for working connectivity is as follows. Arrows represent traffic flow, colours in. This setup completely fixed all connectivity issues for me. The best part is that this does not use NAT between networks except for connecting to work VPN network.